I just finished my first summer read, Paperboy by Vince Vawter. 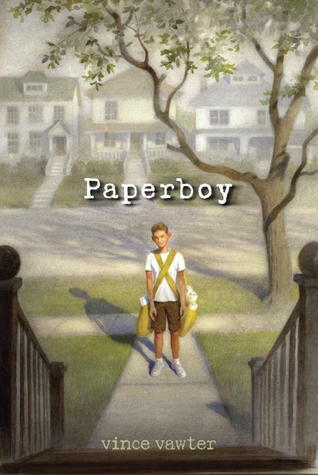 A story about a reflective young boy, who happens to stutter. A boy who experiences a summer that exposes his inner strengths, through listening to what others around him can offer him, as well as their embrace of all he can offer too. I think it is appropriate that author Rob Buyea commented that he loved this book, as Vawter, like Buyea or a Gary Schmidt, develop characters that are as real as someone you know, and you find yourself rooting for their happiness and well being during and after you finish reading. I also know a book is special to me when in between reading it, I think about it and offer insight, as if I am reflecting about someone I care about in real life. For anyone who feels defined by their tangles, or can relate to how that feels, this book will reveal the confidence we all have and need to survive adversity. This book makes a great family read, independent read, and would be a well received read aloud too. 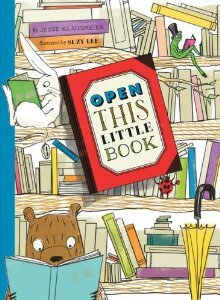 Jesse Klausmeier and Illustrator Suzy Lee's, Open This Little Book is the perfect title for this experience and throughout will continue to entice you to open another...and another...and another little book. This book has presentation, artistic appeal, charming characters; offering satisfaction to the audience that treasures the beauty of special picture books in their collection. 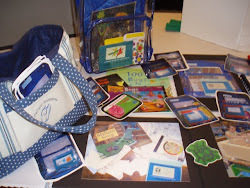 Young readers will marvel over the colors and friendships that develop through the little books. 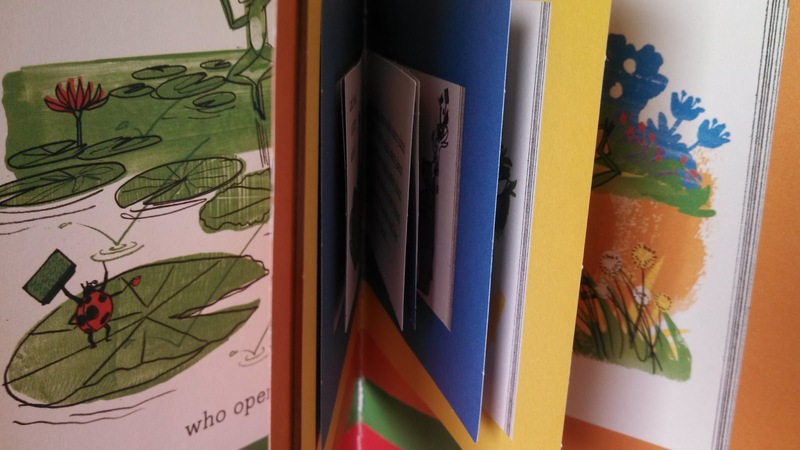 Many of my students share my love for mini books, and I am always amazed at the creative materials and methods they use to make their own versions of mini books and the variety of purpose they bring. 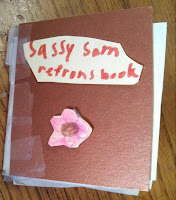 This little book is a mini, Sassy Sam Reference Book that third grader Logan made. 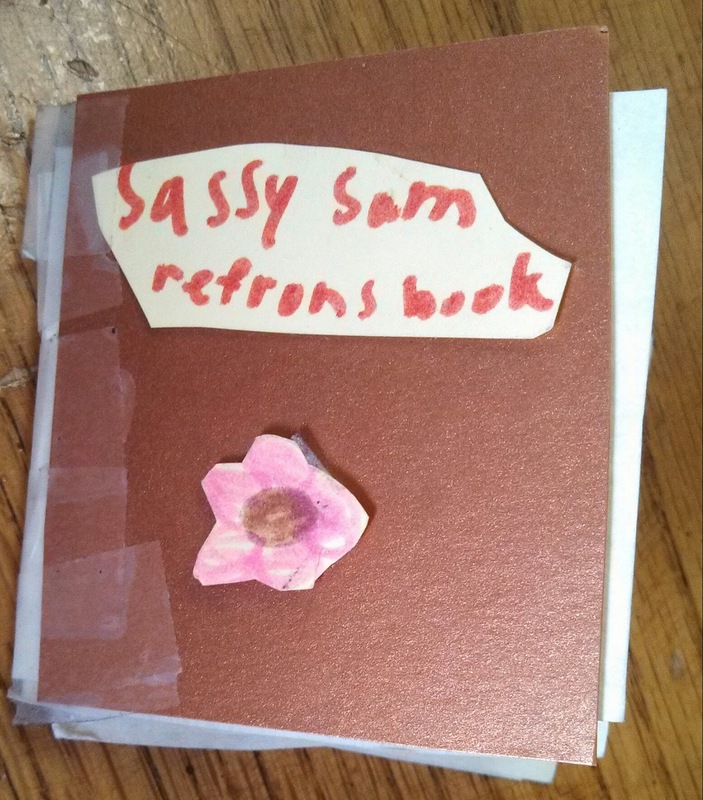 She had previously completed a series of Sassy Sam graphic novels that really exhibited voice and wit. The little reference book was made to thoughtfully support the author's audience. 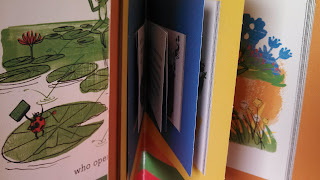 This little peak inside of the book gives you some idea of the layout and illustrations. Such warm colors grace each page. The artist thought about book appeal and as a reader, I appreciate that. The end papers add both an abstract extension to the narrative, as well as offer decorative appeal. 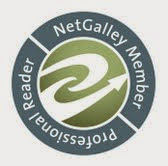 There is a book trailer on illustrator Suzy Lee's website. A Barry Lane Resource that will make you look forward to writing class (and your students too)! I love this Barry Lane book and believe that every teacher should have it as part of their writing resource bookshelf. Practical, fun, academic, and common core covering (without needing to try) writing lessons that you can start teaching tomorrow! After reading about Wacky Reports in Barry Lane's book, I made a template adapted and inspired by his idea, and shared the sample from the book to start the mini lesson with my students. They especially liked the spreading disease grade of C and the comments explained that Musca's egg laying count was lower than expected, so she hopes to spread more Cholera next trimester. 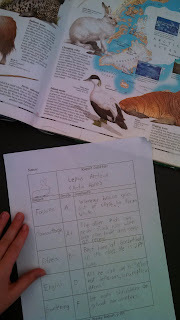 I took my students to the library so they had lots of options and choices to pick a "student" to learn some quick facts about, pick 5 of the most interesting, and think about writing their Wacky Report Card. Students researched interesting facts about an animal or insect of interest. 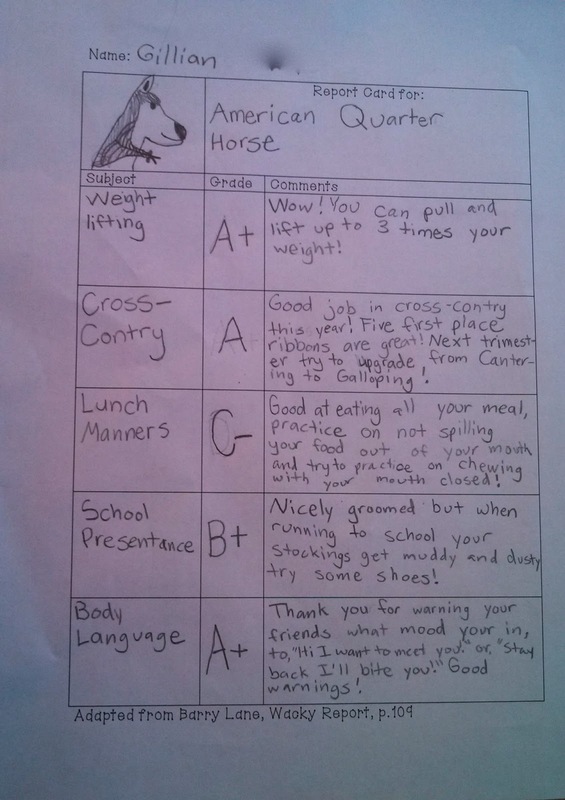 Then they designed a wacky report card to go with their choice, using their knowledge in a challenging way. 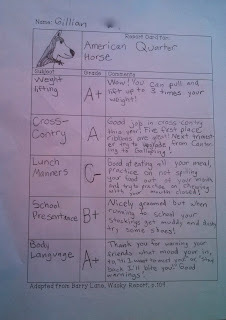 They graded traditional school topics like reading and math, and made up their own too (lunch manners, friendship skills). You could do this mini lesson with famous people and other social studies topics too. 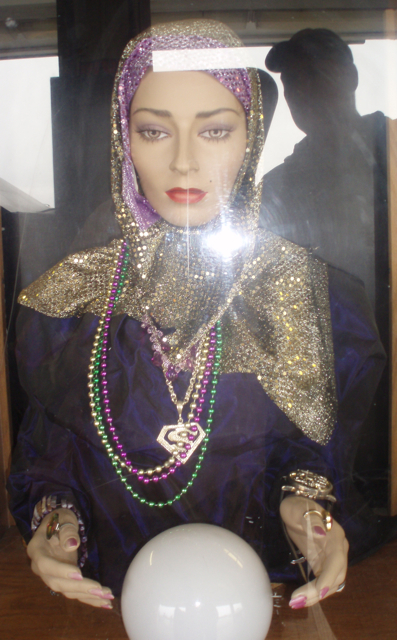 I was impressed by all of their clever ideas. Snow Shoe Hare stays in fashion changing fur color with the season. 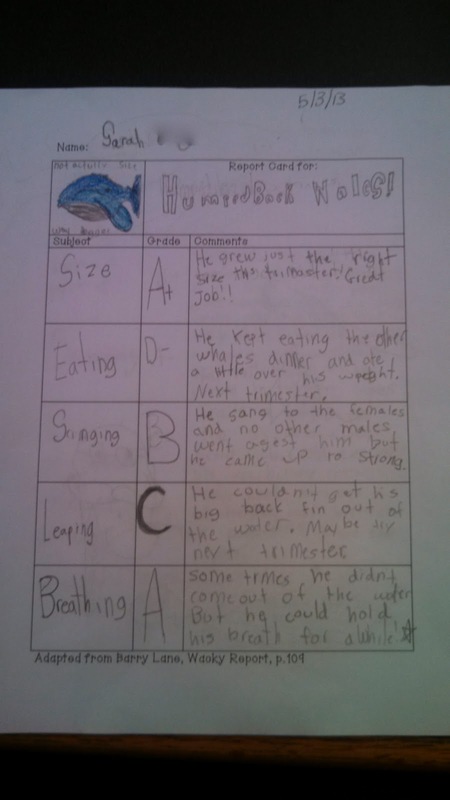 Humpback Whale earned a B for singing beautiful melodies in chorus. 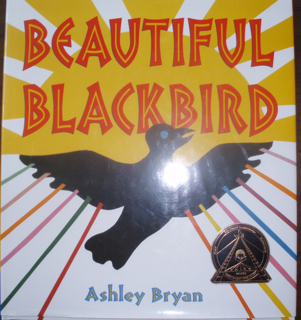 Ashley's Bryan's vibrant and fluent voice bounces and proclaims off the pages of Beautiful Blackbird. 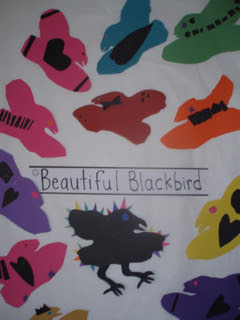 Students made their own birds, each with a touch of black. 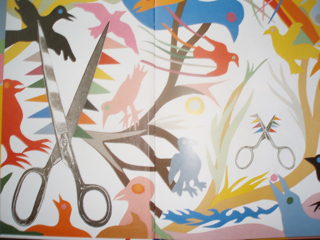 End Papers/ End Pages that display the scissors that belonged to Ashley's mother, and the same ones he used to cut and create the illustrations. That is the type of soulful man he is! 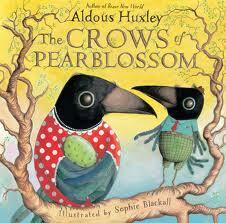 Aldous Huxley's The Crows of Pear Blossom has 21st century illustration's to help retell this classic crow tale.